If and when the deal to take Cesc Fabregas from Arsenal to Barcelona is finalised, it will bring to an end one of the longest-running transfer sagas in Premier League history. But while Fabregas will revel in returning to his boyhood club and Barca hail the homecoming of a player they produced, the 24-year-old is sure to be sorely missed by the team and country he departs. 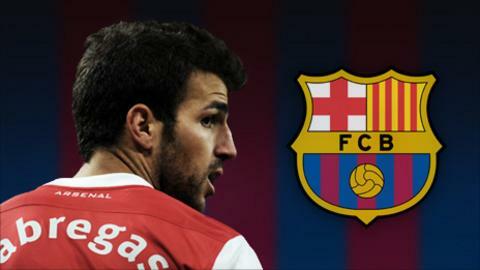 Fabregas arrived in England eight years ago known by precious few outside Catalonia. He leaves as one of the most celebrated footballers on the planet. Undoubtedly one of Arsene Wenger's greatest signings, Fabregas scored 57 goals in 303 appearances and has established himself among the finest playmakers in recent memory. Despite lifting only one trophy with Arsenal, the 2005 FA Cup, he helped Spain win Euro 2008 and the 2010 World Cup. More honours are almost certain to follow with Barca. The reigning Spanish and European champions know exactly what they are getting - and they ought to be delighted. Fabregas has created more chances than any other player in Europe's top five divisions (England's Premier League, Spain's La Liga, Italy's Serie A, France's Ligue 1 and Germany's Bundesliga) since 2006-07. With 466 chances to his name, he eclipses the likes of Barca's Xavi, Frank Lampard of Chelsea, Roma's David Pizarro, Steven Gerrard of Liverpool and Roma's Francesco Totti. Last season, he spent four separate spells on the sidelines, yet only Bayern Munich's Arjen Robben, Mesut Ozil of Real Madrid and Barca's Lionel Messi provided more assists for league goals. There has, however, been much talk about how Fabregas will fit into a Barca squad that already includes the likes of Xavi, Andres Iniesta, Sergio Busquets and Javier Mascherano as midfield options. Interestingly, while Fabregas made the 10th most passes in Europe's top five leagues last season, five Barca players - Xavi, Busquets, Mascherano, Iniesta and Dani Alves - all averaged more per game than him. Keeping everyone happy is a problem Barca must cope with, but Arsenal's main concern is how to replace their talismanic skipper. After becoming the Gunners' youngest first-team player and youngest goalscorer in 2003, Fabregas signed his first professional contract a year later and inherited Patrick Vieira's number four shirt in 2005. So keen were Arsenal to protect their asset that a new eight-year contract was signed in October 2006, and the following season his stock rose with a superb strike in the Gunners' 2-0 Champions League victory at AC Milan. "It was one of the best moments of my career and I went straight to the boss [to celebrate] because without him I would never have had the chance to play in a game like this," he said at the time. "My future belongs to Arsenal, and it is the truth. I have always said I want to play for Arsenal." Fabregas won the 2008 Professional Footballers' Association young player of the year award and soon succeeded William Gallas as captain before enjoying his most impressive season in 2009-10. It came as little surprise when Barca made their first bid for his services - a £29m offer on 2 June 2010 which was rejected - and ever since then his return to the Nou Camp has seemed inevitable. Since the start of the 2004-05 Premier League season, Arsenal have scored more goals, conceded fewer, won more matches and collected more points when Fabregas has featured. They average 2.04 goals per league game with him in the team but 1.52 without him, concede 0.92 when he plays and 1.07 when he does not, win 59% of games with him and 44% without him, and pick up 2.01 points per match with him but only 1.65 when he is absent. Fabregas actually created fewer chances per league game last season than in any of the previous four, but he he was still comfortably Arsenal's biggest supplier and second only to Chelsea's Florent Malouda in the division. All of which is fairly remarkable when one considers the injury lay-offs he was forced to endure. Arsenal's rivals will probably be pleased to see the back of Fabregas - he drew more fouls per game last season than in any of the previous four - and it is Wenger's job to ensure he is adequately replaced. The obvious candidate is Samir Nasri, who tended to assume a more central role and perform far better when Fabregas did not play last season, but he is on the verge of joining Manchester City. Wenger is an admirer of Lille's Eden Hazard and Mathieu Valbuena of Marseille, while Aaron Ramsey has shone in pre-season. But are any of them fully capable of stepping into the magical boots of Cesc Fabregas?